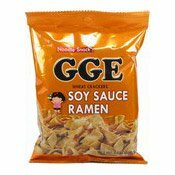 Allergy Advice: Contains Wheat, Peanut, Soy, Crustacean, Sesame. Store in a cool dry place, away from direct sunlight. Once opened, store in an air-tight container and consume as soon as possible. 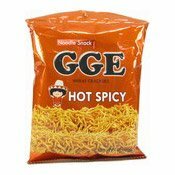 Ingredients: Wheat Flour (50.9%), Palm Oil, Potato Starch, Sugar, Peanut Butter, Soy Sauce (Water, Soybean, Wheat, Salt), Salt, Coconut Oil, Shrimp Powder (Crustacean), Seaweed (0.74%), Yeast Powder, Maltodextrin, Spices (Garlic Powder, Pepper Powder, Chilli Powder), Thickener (E466), Emulsifier (E422), Refined Soybean Oil, Soya Lecithin, E475, E473, Sesame Oil, Humectant (E452, E451, E339, E450, Flavour Enhancers (E631, E627), Mushroom Powder, Colours (E160c, E160a), Acidity Regulator (E501), Antioxidant (E306). 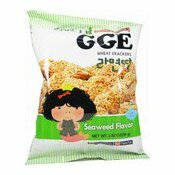 Simply enter your details below and we will send you an e-mail when “Noodle Wheat Crackers Snack (Seaweed Flavour) (張君雅點心麵 (紫菜味))” is back in stock!